This view of Northern California’s Anderson Valley shows the coastal influence of cool, foggy mornings, perfect for producing world-class Pinot Noir and Alsatian varietals. Photo: Anderson Vally Winery Assoc. It must have been the mid-60s when I first saw the Anderson Valley, tucked into a remote corner of California’s Mendocino County, about 2.5 hours north of San Francisco. We were on our annual family vacation, kids packed into the back half of the black-and-white Nash Rambler station wagon while my ever-westering parents kept an eye out for the promised land. Not that they were looking for a new homestead – Colorado had everything they really wanted – but rather simply in search of America and all that it offered. I faintly remember stopping along Highway 128 where it headed northwest into the valley after leaving U.S. Highway 101, amidst towering forests of redwoods and Douglas fir, perhaps the same view pioneer Walter Anderson enjoyed when he first saw the valley in 1851. I don’t remember seeing any vineyards during that summer trip but I do remember my father shivering in the cool breeze, even though the ocean was about 15 miles off, and hurrying back to the car. Today’s tourists are not so quick to dismiss the Anderson Valley, which has earned its reputation for sterling Alsatian varietals (Gewurstztraminer, Pinto Grigio and Chardonnay) and the purity of its Pinot Noir. I recently received samples of two Anderson Valley wines, the 2011 Jolie Anderson Valley Pinot Noir from Maggy Hawk Winery and the Wind Racer 2011 Anderson Valley Chardonnay. 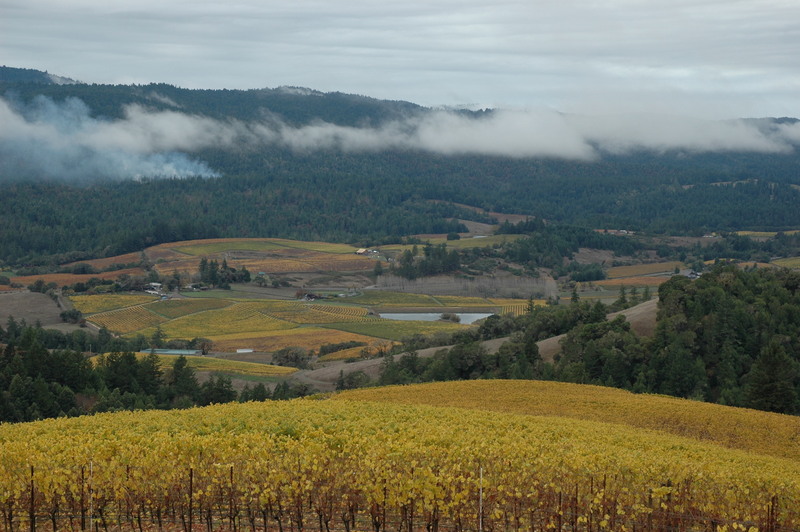 In recent years Pinot Noir has become a major focus in the Anderson Valley, where a 2011 vineyard census showed 1,453 acres out of the 2,244 total planted acres in the valley. Those 76 different properties produce a range of Pinot Noirs, some of a distinctly opulent but hard-edged Russian River Valley style with its out-sized flavors. But the latter still are the outsiders, because the true Anderson Valley style of Pinot Noir is modest and restrained, bright with red fruit flavors. The highly allocated Maggy Hawk 2011 Jolie (242 cases, $66 SRP) is one of a line of wines named for the progeny of Maggy Hawk, a race horse owned by proprietor Barbara Banke. Banke also is the head of Jackson Family Wines and the widow of famed California winemaker Jess Jackson, who died in 2011. The Jolie was floral and tightly wound, showing plum, cherry and cranberry with a minerally acidity and soft tannins, a tribute to the skills of winemaker Elizabeth Grant-Douglas in dealing with the problematic 2011 growing season. And while I know how much the Hosemaster hates to read this sort of thing, this was one of the best Pinot Noirs I’ve had the privilege of tasting. Grant-Douglas also is director of winemaking at La Crema Winery, also owned by Jackson Family Wines. The Wind Racer 2011 Anderson Valley Chardonnay (463 cses, $40 SRP) – This precise and well-focused wine is another effort from Barbara Banke (along with co-proprietor Peggy Furth) and shows a light touch of oak highlighting vibrant apple, spice and pear flavors. The delicate fruit is buoyed by more of the Anderson Valley bright minerality and acidity.